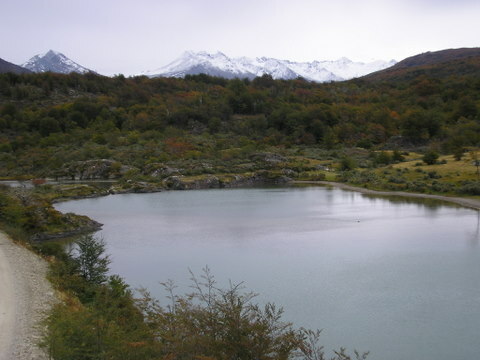 The southern most national park in Argentina’s extensive system, Parque Nacional Tierra del Fuego is a refuge for this environment and especially the endangered Fuegian Red Fox. Seventy-five percent of the park is off limits to any human activity except for scientific research. The Park has a fine system of trails, of varying lengths and degrees of difficulty, ranging from coastal routes to mountain climbs. No matter what trail is chosen, spectacular views of nature, undisturbed by human habitation, are guaranteed. I hiked the 5-mile Coastal Trail and the 4-mile trail to Bahia Lapataia, both rated moderately difficult. The trail ranges from gravel paths to wooden stairs up the sides of the hills to mere indications of where to walk, although getting lost would be very unlikely. 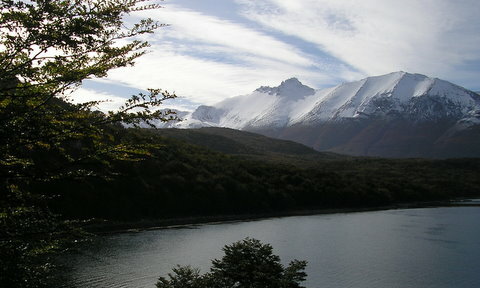 The coast of the Beagle Channel is dramatic. Dozens of craggy inlets contain beaches of pebbles and water carved rocks strewn with bleached driftwood. High tree covered rock walls edge many inlets and, with some frequency, areas of soft green grass look like mowed lawns. The trail undulates from these beaches to climbing into the forest of linga trees, over streams, around bogs of low flowering vegetation and autumn colored leaves. Through the trees, or from the beaches, the stunning vistas of snow covered Andean peaks are always in view. For five miles the trail never ceases to amaze the eyes. The silence is palpable. In this near-polar rainforest the ears do not detect a cacophony of sounds. The birds are present, and their music is enjoyable, but it’s not constant. Frequently, you hear your own footsteps. Insect life is not noticeable, although it must be there, the environment is too cool for many types of insects and even the bacteria that usually consume the fallen trees. Sections of the forest contain many fallen trees that take decades to break down into the soil. Rabbits, introduced by foreign settlement, are frequent. I came across three seemingly wild horses - one a philly. The adults were uninterested as they grazed on a section of lush coastal grass. The philly was curious, and made moves, that I recognized through experience, that she’d like to kick me if I got too close. At the start of the Coastal Trail, a small post office sits on a dock. It’s purpose is for visitors to have mail stamped with fin del Mundo. Quite near the dock I had the rare opportunity, and great good luck, to see and photograph the shy and endangered Fuegian Red Fox. I spied the fox walking out of the forest onto the beach and move towards the post office dock. 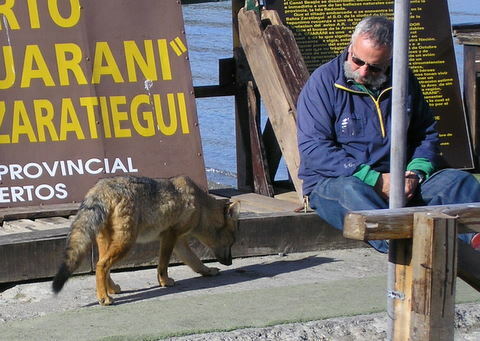 This particular fox, as it turned out, had taken a cautious liking to the postmaster who sat on the dock as the fox climbed the embankment and walked to within 3 feet of the man. The postmaster tossed strips of meat which the Red Fox greatly enjoyed. After eating, the satisfied fox walked over to a sunny grassy spot and reclined like any domesticated dog giving several hikers, including me, terrific photo opportunities.